Performers include: Sonny Shroyer, Samuel E. Wright, John Dehner, John Milford, C. Peter Munro, and Leo V. Gordon. A spin-off of The Dukes of Hazzard, this light-hearted cop series revolves around the mis-adventures of Enos Strate (Sonny Shroyer), a former small-town deputy from Hazzard County. After accidentally capturing two high-profile fugitives from Los Angeles, he’s offered a job with the newly formed Special Branch of the LAPD. Once Enos moves to Los Angeles, he ends up using his small-town ways and charm to solve cases in the big city. His partner on the force is Turk Larry Riley (Samuel E. Wright), a street-smart African-American cop. He and their superior officer, Lieutenant Joseph Broggi (John Dehner) can’t believe Enos’ naive ways — nor his ability to somehow always seem to get the job done. Others on the force include Captain Dempsey (John Milford), Detective Bigelow (C. Peter Munro), and Sergeant Theodore Kick (Leo V. Gordon). Friends from Hazzard County make occasional visits to the big city — Uncle Jesse Duke (Denver Pyle), Daisy Duke (Catherine Bach), and Sheriff Rosco P. Coltrane (James Best) — to check up on Enos and invariably get involved with a case while they’re there. Each episode typically begins and ends with Enos recounting his latest case by writing a letter to best girl Daisy. An ancient Egyptian ruby is stolen from a museum by an ingenious jewel thief who’d twice eluded Broggi. Enos employs some ancient country skills to get it back. Dina: Joanne Nail. Enos: Sonny Shroyer. Dawson: Robert Hogan. Turk: Samuel E. Wright. Darlene: Alfre Woodard. Dempsey: John Milford. Lucille: Nina Hairston. First aired: May 20, 1981. The series was ultimately cancelled after one season and Enos subsequently returned to his job in Hazzard as a small town deputy once more. The Dukes of Hazzard: Reunion! (1997) and The Dukes of Hazzard: Hazzard in Hollywood! 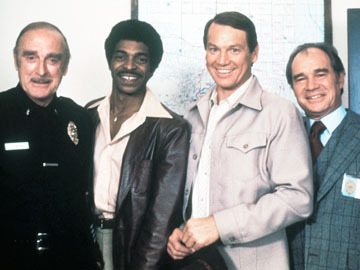 (2000) TV reunion movies had Enos back on the LAPD, first as a member of the SWAT team and then as a detective.